A local General Contractor in Denver, Colorado reached out to GPRS to mobilize to their site and map out the location of reinforcement within concrete slabs. As the largest ground penetrating radar service provider in the Denver Metro Area, they were able to mobilize to the site within one day. GPRS’ local office is located in Littleton, CO and allows for quick mobilization to anywhere GPR is needed in the State of Colorado. The rebar, post tension cables and conduits were locating using concrete imaging at the Denver site. 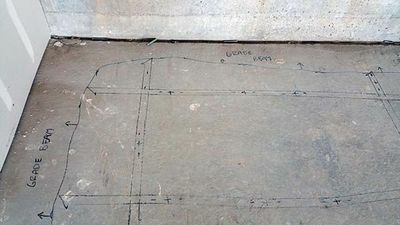 The location of the embedded reinforcement and also the location of the structural beams were plotted on the surface of the concrete. The information was communicated to the site representative so that there was no confusion once GPRS left the site. The ground floor was also scanned, slab on grade, and grade beams were able to be mapped. Ground Penetrating Radar Systems, LLC. of Colorado can provide similar services on your site across the Front Range area. Our services include; private utility locating, Underground Storage Tank locating, abandoned well head locating and sub-surface void locating prior to setting cranes or heavy loads. On the concrete side we can easily map rebar, post tension (PT), beams, conduits, shallow utilities, concrete thickness, dowel placement and CMU Wall scanning. Our service area includes Colorado Springs, Fort Collins, Cheyenne, Boulder and Greeley. Please call or email for a fast quote today before excavation, coring, cutting or boring takes place.